Peder Sather was a scribe before he emigrated from Norway to New York in 1832. There, he worked as a servant and a clerk at a lottery office before opening an exchange brokerage. During the gold rush, he moved to San Francisco to help establish the banking house of Drexel, Sather & Church on Montgomery Street. Sather was a founder and a liberal benefactor of the University of California at Berkeley where he is memorialized by the Sather Gate and Sather Tower (the Campanile), three endowed professorships, and more recently the Peder Sather Center for Advanced Study. Karin Sveen, one of Norway’s most accomplished writers, pieces together a story yet untold—a beautifully crafted biography based on her dedicated search for scraps of information. 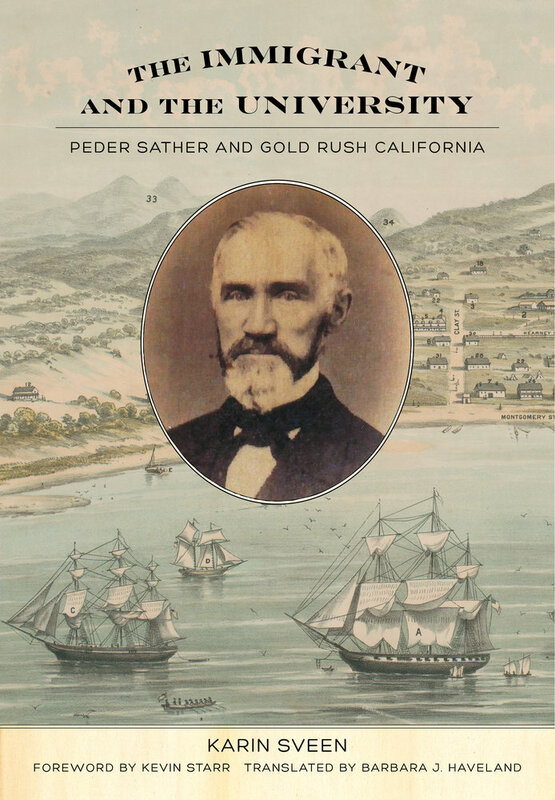 The result gives readers a look at the life of a successful entrepreneur and a leading California patron who engaged in public education on all levels; supported Abraham Lincoln; and worked to give emancipated slaves housing, schooling, and employment after the Civil War. His legacy and vivid persona and the frontier city of his time are brought to life with interesting anecdotes of many famous people— General William T. Sherman, Walt Whitman, Mark Twain, Robert Louis Stevenson, the Norwegian violinist Ole Bull, and above all, his close friend Anthony J. Drexel, legendary Philadelphia financier and one of the founders of Wall Street. Karin Sveen is a Norwegian poet, novelist, and essayist. She was awarded the Norsk språkpris (Norwegian Language Prize) in 2007. Barbara J. Haveland has translated for many notable Scandinavian authors, including Peter Høeg, Linn Ullmann, and Jan Kjærstad.